The Bible’s power to change us stems from the fact that it is God’s Word, breathed by Him and absolutely trustworthy. Simply agreeing with this truth is not enough, though–in order to hear God speak, we must read His Word. In this selection of messages, Alistair Begg encourages us to read the Scriptures prayerfully every day and apply what we learn, allowing the Word to do its work in our hearts. Learning how to handle God’s word is critical to our sanctification. Only the Holy Spirit can give an individual the desire to learn the scriptures, but we need to cultivate that desire and become disciplined in our quest for truth. Being disciplined includes using proper hermeneutics when we study our Bibles. In this sermon Alistair illustrates some key areas where this might apply. 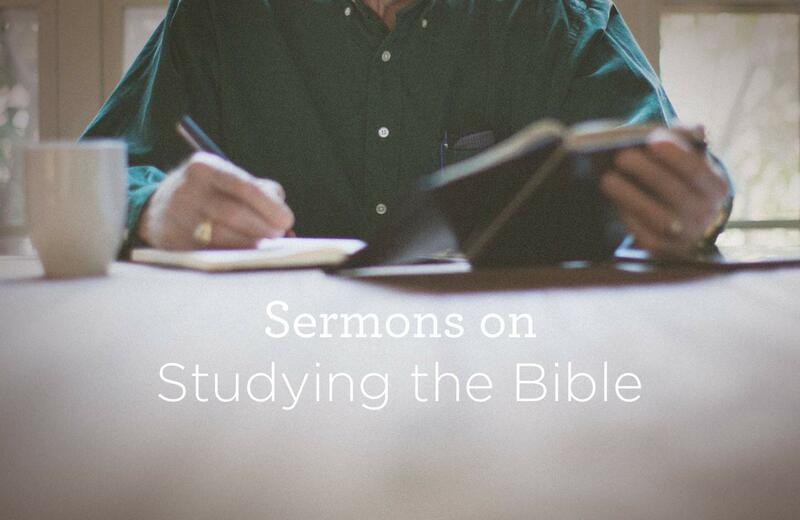 In this sermon, Alistair Begg shares personal words of wisdom from the flyleaf of his Bible. He exhorts and encourages us with some foundational truths about Christian living. He points out that Jesus is worth serving well, humility is crucial, prayer is foundational, relationships take time, and perseverance will yield good fruit. As we seek to live for God’s glory, we will be helped if we regularly remind ourselves of these truths. As the Apostle Paul anticipated the end of his life and ministry, he wrote a clear request to the young pastor Timothy: stay true to the sound teaching he’d received from his mentor. Alistair Begg challenges us in this message to deepen our own understanding of the Gospel by applying our minds to the study of Scripture and by incorporating its truths into our lives. The Bible is one book, by one author (God) with one subject, the Lord Jesus Christ. From Genesis to Revelation, Alistair helps us discover that the Bible contains one overarching storyline. Beginning to end, the Bible reveals the fulfillment of God’s kingdom and His plan to offer salvation through Jesus Christ. This sweeping study traces the unfolding story of God’s kingdom as it is promised and ultimately fulfilled. In the early church, the Apostles faithfully taught from the Scripture because understanding the doctrine of God is the only way to truly know Christ. Therefore, it is essential that we study our Bibles and accurately interpret Christian doctrine with the help of expository preaching that is faithful to the Word of God. We can only love God with our minds when we come to know Him through proper study and worship. More Resources on "The Bible"
An Overview of the Bible ―The Bible is one book, by one author, with one subject: the Lord Jesus Christ. Free Bible Reading Plan (PDF) ― Download a 1-year Bible reading plan from Truth For Life with Alistair Begg. How to Know God's Book ― It's so very important for God's people to know the Bible. The New Testament ― In "A Superior Covenant", learn how the New Testament is understandable only in light of the Old Testament. Can I trust the Bible? ― Suggested reading list affirming that the Bible can be trusted. Why Bother with the Bible? ― Isn’t it just an archaic book that’s not relevant to our modern lives? Read Your Bible ―In "The Work of the Word", Alistair Begg affirms that Scripture is trustworthy and examines how God has purposed it to be a guide and an agent of change in the Christian walk.